Shandong Province is situated in the eastern part of China on the lower reaches of the Yellow River. It borders on the Bohai and Huanghai seas in the east, and overlooks the Korean Peninsula and the Japan Archipelago across a vast stretch of sea. The province has a total area of 156,000 square kilometers (about 60,235 square miles) and a total population of over 90 million. Shandong Province is frequently affected by marine monsoons, especially during the summer time. The climate is characterized by rain during the summer and autumn and a dry winter. The annual average temperature is between 11 and 14 degrees C while the annual precipitation is mostly affected by the monsoon rain. Between 500mm and 1000mm of rain can fall each year. Shandong, with a history of more than 5,000 years, is considered one of the birthplaces of Chinese civilization. Shandong has also been the home of a large number of historical figures, whose important influences are still evident in contemporary China. Confucianism, founded by Confucius, the great thinker, educator and statesman in China is the pillar of traditional Chinese culture and has exerted great influence in the world. The inscriptions on clay pots unearthed at Dawenkou and Dinggongcun are believed to bear the earliest Chinese written language. The ruins of ancient Longshan City which is considered the earliest city in China. Portions of the Great Wall built during the Qi State period which is believed to be the most ancient great wall in the country. The Confucius Temple, Confucius Mansion and Confucius Cemetery in Qufu. Shandong is also blessed with beautiful landscapes. The most famous scenic spots are Mount Taishan, Mt. Laoshan and the seaside of the Jiaodong peninsula. In 1987 and 1994, Mount Taishan, the Temple and Cemetery of Confucius and the Confucius Mansion in Qufu were inscribed on the China World Cultural and Natural Heritage List by UNESCO. Jinan, Shandong's provincial capital is one of China's most famous historical and cultural cities. It has numerous natural springs, hence its name 'Spring City'. Shandong Province is also considered the birthplace of China's pottery, porcelain and silk. 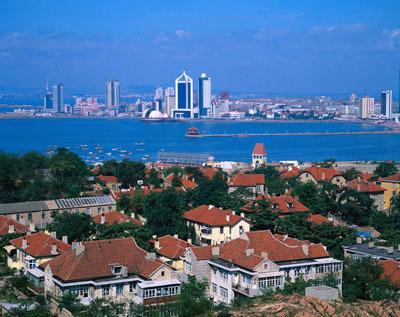 Throughout the province the tourist can find traditional items like the clocks and watches of Yantai, the porcelain of Zibo, the kites of Weifang, the shell-carving and beer of Qingdao.